Recognize the face on the left? 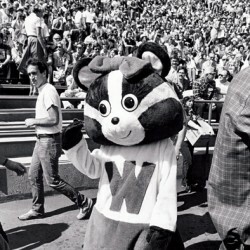 That, Badger fans, was your mascot, prior to Bucky. 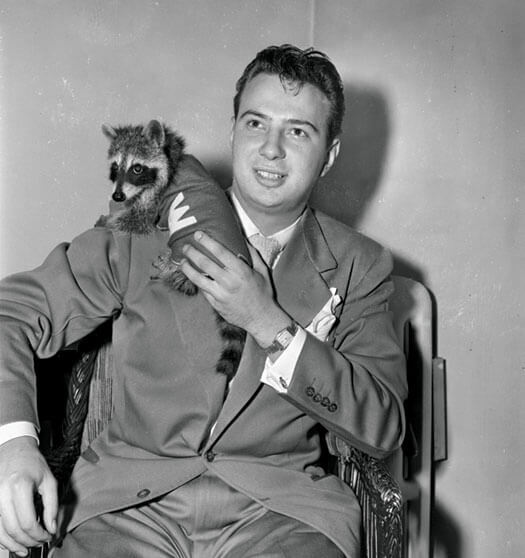 Named Regdab (for those unskilled at anagrams, that’s badger spelled backward), he was described as a badger in a raccoon-fur coat, and he represented the UW for just a year. 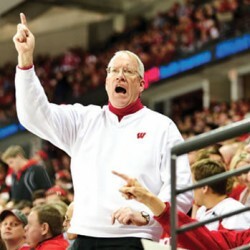 His friend is George Holmes ’49, a member of the Badger yearbook staff. The UW’s sports teams have always been nicknamed the Badgers, evidently deriving from a derisive term for the lead-miners who were the region’s first white residents. (They lived in holes in the ground, like wild badgers do.) 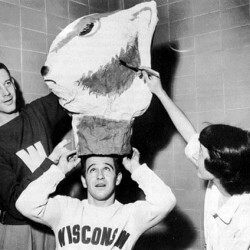 In the early twentieth century, the university had a live badger (acquired from Eau Claire) attend games. But the critter was unsociable and liable to bite his handlers, cheerleaders, fans, athletes, or anyone else who crossed his path. The UW packed him off to Vilas Zoo. In 1948, as the university was preparing to celebrate its centennial, the staff of the Badger yearbook offered Regdab as a replacement. The juvenile raccoon, in its red-and-white W sweater, was easier to control. But for all the cleverness that went into his creation, Regdab wasn’t a badger. He didn’t catch on. In 1949, Bill Sachse ’50 came up with the idea for Bucky (see “Flashback” in the Fall 2012 issue), and Regdab, too, was retired.